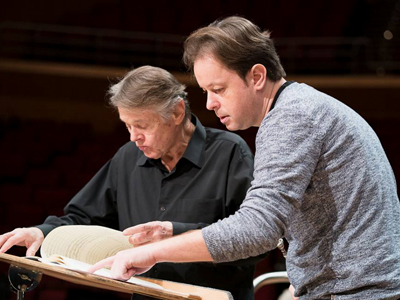 MUNICH — Against the medical odds, perhaps, Mariss Jansons turns seventy-five on Sunday, still adored by his favorite orchestra. Bavarian Broadcasting marks the occasion with a 44-minute video portrait, Im Zeichen der Musik, or In the Music’s Character, freely watchable. Last evening here at the Gasteig, a subscription concert of the Symphonie-Orchester des Bayerischen Rundfunks paraded contrasting sides of the musicians’ long union with Jansons, and everyone’s versatility. Martin Angerer navigated the elegant byways and tricky trills of Hummel’s Concerto a trombe principale (1803) with apparent ease in its original key of E, tidily accompanied. In an interview, the section principal distinguished this “godly” tonality from the “mundane” feel of E-flat, taken often in a convenience edition of the Hummel he deems a “stab in the heart,” but he stopped short of chancing the performance with the kind of Klappen-Trompete used originally, preferring the luxuries of a modern American piston instrument. (Soloist and conductor are pictured midweek.) Genia Kühmeier, Gerhild Romberger, Maximilian Schmitt and Luca Pisaroni made an impeccable quartet for the program’s main work, after the break, Beethoven’s C-Major Mass (1807), although the bass for some reason sang half-voice. The BR Chor glowingly intoned its lines yet struggled to focus the words in the acoustically poor venue. Jansons led supportively but as always from the ground up, never from the bowels of the Earth, and showing no inquirer’s zeal for the imaginative score. His clinical manner and the Bavarian players’ skill found their most persuasive outlet in an episodic exercise in chromatic unrest at the top of the evening: the Symphony in Three Movements (1945) of Stravinsky. Here, structure reigned, details sparkled, and the con moto third movement sounded (suitably) die-cast. It was in 2003 that this celebrated partnership began, since when the demanding and fussy but personable Latvian maestro’s contract has been renewed with accelerating commitment: for three years in 2013, and for three more years less than two years later — right after he sounded receptive to a theoretical, but as it turned out imagined, offer in Berlin. Which takes us up to 2021, past several happy birthday returns. This entry was posted on Friday, January 12th, 2018 at 10:42 am	and is filed under Munich Times. You can follow any responses to this entry through the RSS 2.0 feed. Both comments and pings are currently closed.